#OOTD - Spring Is Here! I don't know about you but I'm SO happy it's officially Spring. We can finally store away those heavy, oversized (itchy) Knits and dark, depressing colour palettes to replace them with light, fresh, printed and colourful Spring wear. For my first Spring outfit of the day I decided to wear dark denim MOM jeans from Mango, I rolled the bottoms up as they are a loose fit. 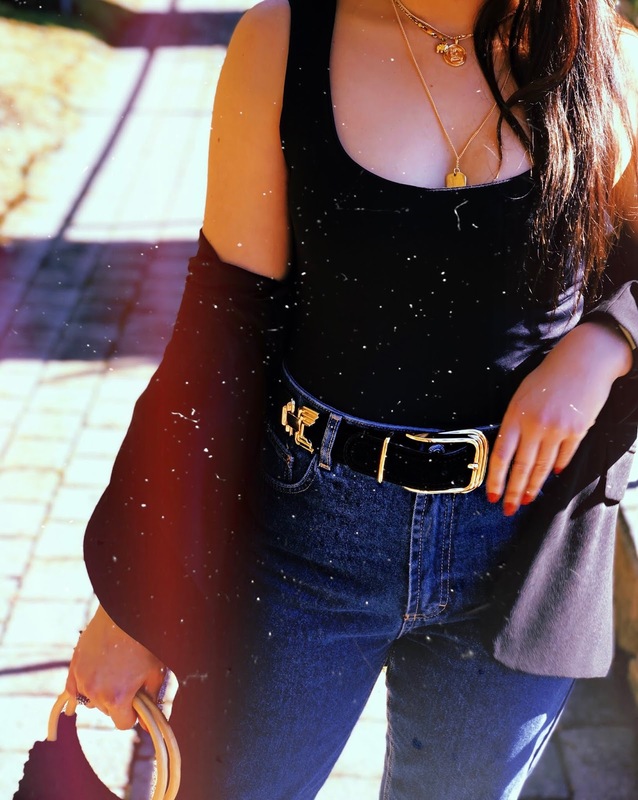 I accessorised the jeans with a black, velvet belt with a gold buckle, from ZARA. Finding the perfect MOM jeans has been a mission in itself for me. For some reason brands seem to size MOM jeans in a strange way, meaning they make the sizes ridiculously SMALL! I am not even exaggerating when I say I have ordered or tried on in stores about 20 different MOM jeans in the last two years and none of them have fit me! I am usually a size EU 36/38 in jeans and every MOM jean I have tried on in this size, literally doesn't go past my thighs! The MOM jean originated from the Vintage high-waisted Levi 501 style from the 80s/90s and brands have all replicated this style of jean. The MOM jean look should be high-waisted and baggy not a skinny jean. So after trying on all these different MOM jeans and returning all of them, I finally decided to order a Vintage style MOM jean in a dark denim from Mango, two sizes up from my usual size! For those that have struggled like me, to find that perfect MOM jean I would recommend you do what I did and order a size one or two above your usual size or search for a Vintage MOM jean as they are usually sized and fit correctly. I would have preferred a pair of original Vintage MOM jeans ideally but that wasn't an option for me as they lack in Vintage stores where I live in Switzerland. Back to my #OOTD, I wore a basic, black vest top from ZARA and tucked it into the Mom Jeans and I wore a long, oversized, black blazer on top, also from ZARA. A black blazer can do wonders to an outfit! Not only does it dress up casual wear, it is also super flattering! In my case, body wise, I don't feel Spring/Summer ready and I feel a bit bottom heavy and so the blazer was a great tool to use to hide that factor. Blazers also look great with cute, spring dresses, bike shorts, anything really! The blazer materials are usually light which means they are great to keep warm in the Spring cooler temperatures and it doesn't make you profusely sweat when wearing it in the sun either. Blogger Recommendation: Purchase a basic oversized blazer this Spring, get it on your shopping list! I then accessorised the outfit with a straw hat with black ribbon detailing from H&M, (I LOVE a straw hat in the Spring). 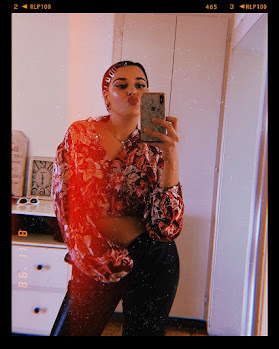 I wore this with round, black, 90s style sunglasses also from H&M, a gold multi-chain necklace, leopard printed sandals and a black netted bag, all from Topshop. I am a big fan of the Leopard print's colour palette of tan hues and I think the colours look great with dark denim, white and red. Also I think string and straw bags are going to be a huge street trend again this year, as it was last year. Let me know what you think of this #OOTD in the comment box below! Can You Pin It With Old English Co? The Best Dressed at Cannes Film Festival 2017:Who Wore What?